Silver to treat cancer ? Can silver be used to treat cancer ? 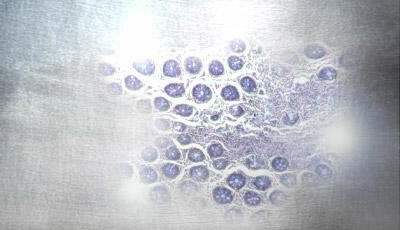 According to Leeds University (England), the internet is "awash with stories of how silver can be used to treat cancer". Perhaps some of those stories inspired recent research there. Leeds scientists have now shown that certain silver compounds are as toxic to cancer cells as the platinum-based drug Cisplatin, which is widely used to treat a range of cancers. The crucial difference is that silver is thought to be much less toxic to healthy human cells, and in some cases, may even be beneficial. Silver is currently used for its antiseptic and antibiotic properties, in bandages, wound dressings and water purification filters in the third world. Conversely, nausea and vomiting, kidney damage and an increased risk of infection are commonly reported side-effects of Cisplatin which is used to treat lung cancer, breast cancer, and other cancers of the bladder, testicles, head and neck, ovaries and lymph nodes.
" As many are unfortunately aware, chemotherapy can be a very gruelling experience for the patient. Finding effective, yet non-toxic drugs is an ongoing problem, but these preliminary results are an important step in solving it." " Our research has looked at the structure which surrounds a central silver atom. This 'shrubbery' is what determines how reactive it is and what it will interact with. Our research has used different types of these ligands to see which is the most effective against cancer cells," added Dr Willans. The research, which is still the first phase of drug development, involved exposing breast and colon cancer cells with different silver-based chemicals for six day periods. It has been shown that ligands which are co-ordinately bonded to the central silver atom through two sites are more effective than those coordinated through only one site. This may be due to the release of silver being much slower and make these compounds more effective over a longer period of time. A barrier to the continued development of these silver compounds is a lack of understanding of how they work. Over the next 12 months, research will focus on investigating how the compounds damage cancerous cells and what effects they have on healthy cells. This will establish whether or not these silver complexes are less toxic to ordinary human tissue, and will help to design and develop the next-generation of chemotherapy drugs. News is included on the IvyRose website to inform visitors about current health issues and research, but not to endorse any particular view or activity. Any views expressed in the article above are not necessarily those of IvyRose Ltd.. Material in this news item was released by the source listed below on 02 February 2012 and may have been edited (e.g. in style, length, and/or for ease of understanding by our international readers) for inclusion here. For further information, please visit the website whose link follows below.